When the Mafia, as best represented by Don Steffano and Big Tuna (Andre Philippe and Vincent Barbi) try to overrun Pop Byrd (Crothers) and his BlackByrd karate studio because they want the land it’s on, a conflict ensues. 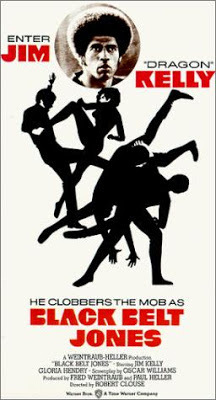 So the best man for the job is called in to clean up the mess with the mob: Black Belt Jones (Kelly)! Enlisting the help of Sydney (Hendry), who’s one bad mama, the two do what they do best: kick and punch the unwitting baddies until their heads spin. But will the mafia give up, or will they continue to fight? Find out today! 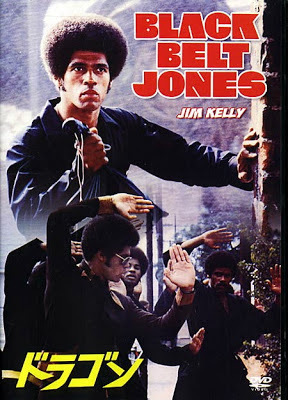 Black Belt Jones is classic 70’s Blaxploitation all the way. It’s an extremely enjoyable and lighthearted romp, filled with everything that makes the era great: fly threads, cool cars, big hair, evil whiteys and of course the music, the theme by Dennis Coffey and the rest by Luchi DeJesus. The music is integral to the film and goes a long way towards propelling the action. It’s also completely great in its own right, and while it, surprisingly, has never been reissued on CD (as far as we know), there is a reissue LP that’s floating around out there. It’s easy to forget this, but Jim Kelly’s actual name in the movie is Black Belt Jones. No other name is given - ever. So dialogue like this is heard: “Belt, you better get over here quick”. This among many other examples. But Jim Kelly is one cool customer, and everything he does is cool - he even presses a button for an elevator in an amazingly cool way. Most of the movie is just entertaining and funny, in that way that movies were in the blissful age before political correctness corroded the world. It also was ahead of its time, as it features prominently women on trampolines, predating The Man Show by 25 years, and, having a character named Big Tuna, it predates The Office by a whopping 31 years. There’s also what might be dubbed a “Black Belt Funeral” (not for Jones, of course - but don’t you want some strong Black Brothers practicing their moves next to your coffin - next to what looks to be a painting of Toshiro Mifune? We thought so.) And the movie all comes to a head at a car wash with an insane amount of suds everywhere. Apparently car washes were huge in the 70’s. We had seen this movie on the Warner Brothers big-box VHS, but then re-watched the Widescreen DVD, which is a nice improvement and a worthwhile purchase. So travel back in time to when Martial Arts was FUN and definitely see Black Belt Jones! Loooove this. I've only ever seen it on my Big Box VHS as well, so I'll definitely check out the DVD. Nice review! Thanks! That is really cool that you have the Big Box VHS. This is one of the best.